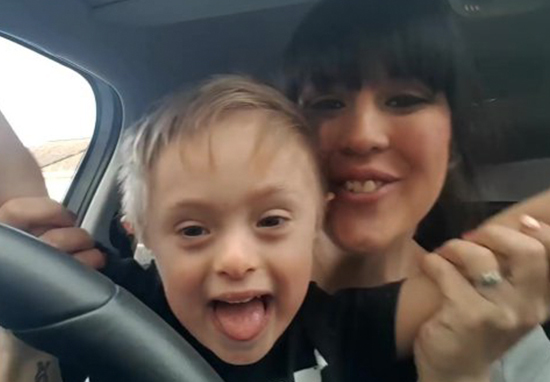 A ‘beautiful’ Carpool Karaoke-style video has gone viral, featuring mothers singing along with their children who have Down’s Syndrome. A total of 50 mums, along with their kids – from all over the country – made the emotional video to the song ‘A Thousand Years’ using Makaton – a form of sign language. 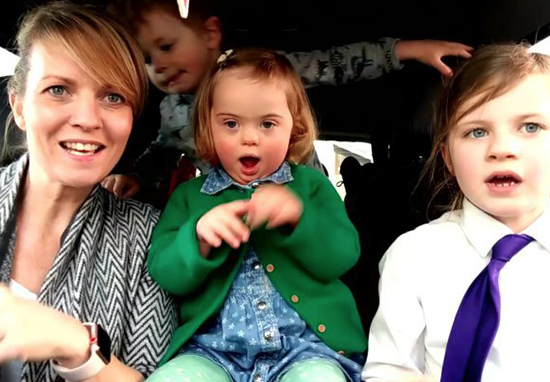 The mums hope the video, made for World Down’s Syndrome Day, which is on March 21, will change perceptions of people with the condition and show how they ‘Wouldn’t Change a Thing’. The idea came from a Coventry mum, Becky Carless, whose four-year-old son Archie has Down’s Syndrome. 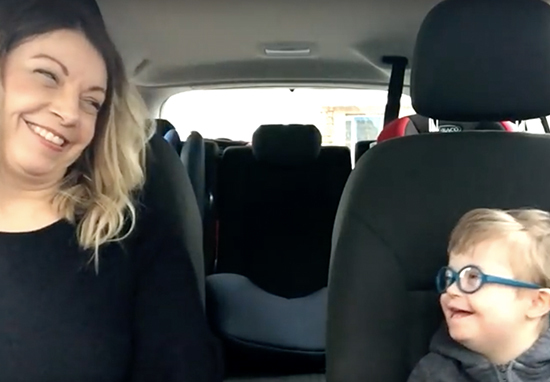 She saw a Singing Hands car karaoke video signed with Makaton and wanted to replicate the idea with other mums and their young children who also have an extra chromosome, report the Coventry Telegraph. The mums are all part of a Facebook group known as ‘Designer Genes’, which was created for parents who have a child with Down’s Syndrome born in 2013/14. She was not alone: 50 mums and 50 kids released their versions of the song, performed using Makaton, a form of sign language that is designed for people with speech problems, and is commonly used by those with Down’s Syndrome. They were inspired by Singing Hands, a YouTube channel which encourages people to learn the language set to music as a way to help their children and to have fun at the same time. Becky contacted other mums with Down’s Syndrome children via Designer Genes, with many members watching Singing Hands videos to help them learn Makaton to support their children’s communication development. We believe this video really does have the potential to be the most viewed across the world on World Down Syndrome Day this year, so we urge everyone to share, share, share to help us make it a success! I feel so proud to have come up with this idea. People around the world are sharing it and it’s crazy to think I came up with this small idea and it has gone so far. I have had messages from anyone and everyone across the world. However it was a dad in the Facebook group who pulled all the clips together to produce the video titled ’50 mums, 50 kids, 1 Extra Chromosome’. James Corden, who’s responsible for the idea of Carpool Karaoke tweeted about the video, calling it ‘beautiful’. The video, which only went live on Friday morning, (March 16), has apparently been supported by LA artist Christina Perri, whose song, ‘A Thousand Years’, is the soundtrack. The group contacted Christina Perri via her husband, Paul Costabile, on Twitter. They revealed how within an hour, the couple were declaring their support for the video, committing their multi-million social media following and waiving any copyright claim to the music in support of the campaign. Such a beautiful video and message!!! It’s a MUST WATCH and a great reminder of the absolute gift all those living with disabilities are to this world [sic]. Paul went on to declare he’s a life-long advocate of children with special needs, in particular Down’s Syndrome. He produced the film More Alike Than Different with his sister for World Down’s Syndrome Day back in 2015. Down’s Syndrome is a naturally occurring chromosomal arrangement which has always been a part of the human condition, exists in all regions across the globe, and commonly results in variable effects on learning styles, physical characteristics and health. World Down’s syndrome Day is March 21, 2018.